Google Ads (formerly Google AdWords) is the largest of the various Pay-Per-Click (PPC) providers due to the nature of its far reaching search engine. PPC can be very effective for many types of businesses pursuing advertising success within an Inbound Marketing environment. Inbound Marketing is a holistic, data driven approach to marketing that attracts individuals to your brand and converts them into lasting customers. It is multi-channel marketing. It is multi-channel by nature because it approaches people where they are, in the channel which they want to interact with you. With Google Ads, Trends, Analytics, and Search Console, vast data sets pertaining to consumer ( location, demographic breakdowns, web site stats, and online behaviors ) can be a massed. This data mass supports a statistical domain for analytically derived insights and managed strategies that can drive a successful online advertising campaign. With Google My Business, Google Maps, Google Branding Pages, YouTube, and a host of other Google products and services, the ante only goes up to “get on board” as Google provides advertisers and businesses with a continuously growing, and interlinking network for online visibility and presence. Google Ads is the largest PPC provider in the search network operator landscape. Online advertising is about showing your ad, to the right person, in the right place, at the right time. With online advertising you can deliver your ads to the searches likely to be directed to your products and services, while filtering out less relevant queries. 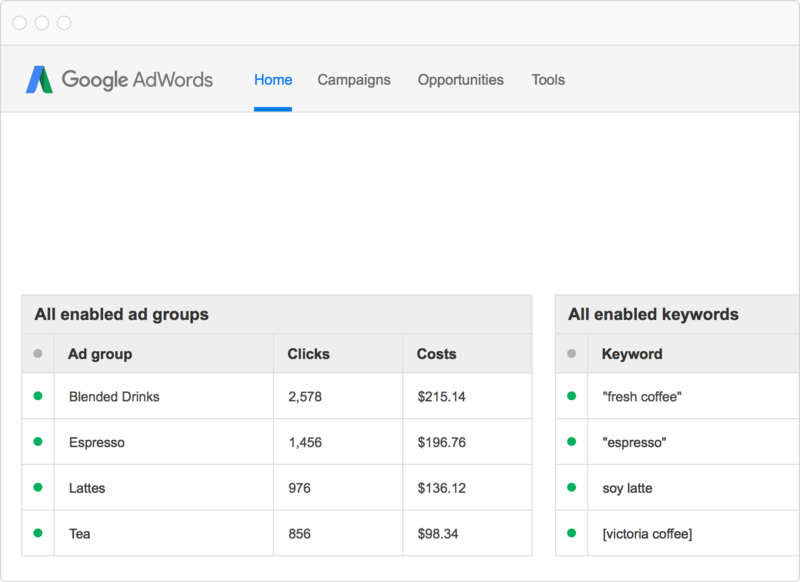 And you can track whether those search terms triggered clicks on your Ads. In addition, online advertising can reach potential customers as they use multiple devices — desktops, laptops, tablets, and smartphones. 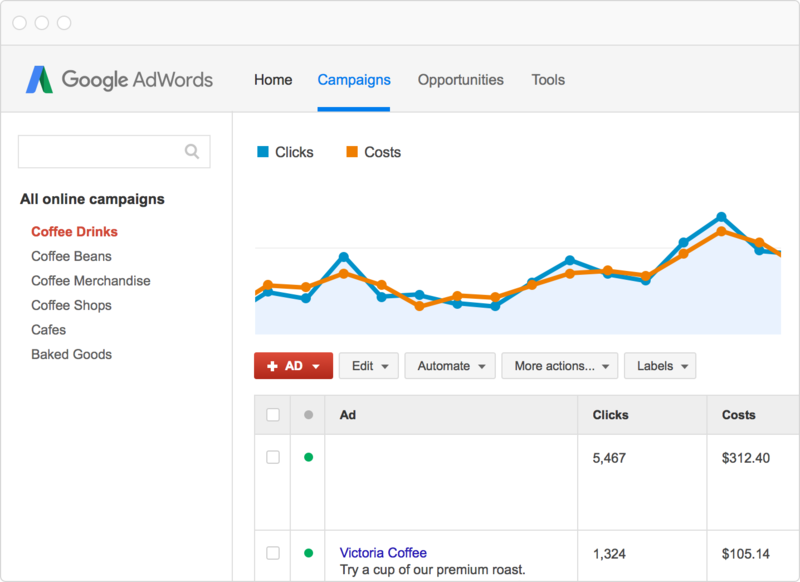 Sophisticated data collection and filtering tools in the Adwords Interface, combined with the intelligent application of analytically derived optimization systems, algorithms, and event learning strategies, provide for ever evolving, dynamically responsive, campaign tactics zeroing in on advertising objectives and goals. This depth of granular insight into “target audiences”, campaign details, performance metrics and ad spend, would never be possible with “traditional advertising”. From this frame of reference, developing and refining a PPC management process is essential towards delivering a positive, and or meaningful return on Ad Spend over the life of a PPC advertising program. ● Market and Competitors: Researching competitor sites and searches. Applying diagnostic tools to discover trends and volume characteristics of key search terms and first page bids. Initial research findings, ( observations , interpretations / holes in the data ) are used to formulate a “ test campaign ” that explores the market environment, refuting or confirming assumptions on strategic imperatives. This phase implements the “test campaign” and gathers data. This accumulation period depends on data volume/time. It is a procedural, methodical, critical monitoring period of performance data relating to…keyword phrases, Ad copy and associated landing pages, bid strategies, budget realizations, and possibly location, time, and demographic considerations or recommendations. In a Display Network Branding campaign, this would include confirming target audience criterion. Careful observation and scrutinization of data results during this phase formulates a campaigns blueprint. Highlighting the particulars and PPC data component combinations that stand out , the most effectual campaign structure emerges in sync with a campaign’s objectives and goals. This process establishes a foundation and a model for the PPC advertising programs direction. Insights, observations, and conclusions from the evaluation phase are leveraged and implemented towards achieving performance goals. Opportunities for increasing Quality Scores and refining bid strategies are examined and employed. Mathematical equations and statistical analysis are used to build charts and tables that help discover new Adwords optimizations to improve PPC results. ● Explore New Ideas: Experiment and test : new ads, keywords, placements, ad schedules, etc. This phase typically incorporates A / B or multivariate testing to ensure optimal campaign performance. Developing a successful PPC advertising program is an iterative process that is never fully optimized due to changes in technology, market preferences, and the competitive landscape. Clear, well-defined, transparent communication from agency to client is imperative. Technologically advanced economies at the macro level optimize by freely distributing capital to ever more sophisticated divisions of specialization. The macro digital marketing netscape (millions of businesses) is no different. PPC management services specialize in data analysis, web page to PPC system integration, and executing campaign strategies into the digital advertising milieu. The owner of the PPC account, by nature of condition, has the most exposure to risk, greater sensitivity to Ad Spend outcomes, and should derive more meaningful conclusions to the PPC advertising programs data driven interpretive results. After establishing a good communication channel during Phase 1 the “ insights/recommendations” transmission line is extended and sustained by means of customized, detailed reporting. PPC Reporting is about finding the meaningful relationships / trends in data sets that exact greater influence on campaign goals / objectives. Web Analytics is about studying the data flow of web traffic. Good reporting should present relevant data insights in context to objectives and specific considerations. Reporting is the window from PPC data to client. That window should provide a clear and transparent view into account/market dynamics that a client can evaluate with the metrics most related to their business acumen. In process graduating to higher degrees of confidence in approving of/or executing managed risk-weighted advertising ventures. A good report illustrates the account essentials relative to the present goals and provides building blocks for dialogue as to account direction between client and agency. Google Ads is consistently seen as one of the best ways to reach your prospective customer, drive traffic to your business, and ultimately increase sales. Wirefreesoft can help your business develop a customized Adwords Solution using our optimized algorithms to save on advertising costs and improve competitive Ad strategies. Does your business need a Google Advertising Expert?